8020 Admin is here to help and protect our community. If you need help or have concerns please message 8020 Admin. ATLANTA, Jan. 15, 2019 (GLOBE NEWSWIRE) -- BitRail, the new blockchain-backed infrastructure that enables organizations to operate regulatory compliant cryptocurrencies for payments, has launched its signature product to transform the way people do business. Today’s launch eliminates the need for institutions and enterprises to rely on costly credit cards and high-fee digital payment options. BitRail helps establish legal and compliant cryptocurrencies for all types of transactions and the ability to securely complete them with an intuitive, easy-to-use app. Through a partnership with ICOx Innovations Inc. (TSXV and OTC: ICOX), which designs and creates branded blockchain economies for established companies to benefit and grow their businesses through blockchain technologies and branded corporate currencies, BitRail challenges the notion that corporate currencies are too speculative and unreliable for everyday payments. The technology offers secure, instant transactions and the ability to simply convert funds between fiat and crypto. The BitRail framework is ideal for e-commerce sites, online marketplaces, charities, and shared economy vendors, among others. Through customized deployment, entities can quickly establish their own branded cryptocurrencies and offer them as a payment options during check out eliminating prohibitive transaction friction. The platform is highly scalable and fully integrable. Users can purchase the branded coins with U.S. dollars and store them in a BitRail provided personal, secure blockchain wallets until needed. Buyers and sellers can then choose to accept and use the fully regulated, branded cryptocurrencies for transactions. BitRail recently signed GunBroker.com, the world’s largest online marketplace for hunting, outdoor sports and firearm products, as its first client. After dealing with a shrinking number of cost-effective payment options for its users, the e-commerce giant intends to launch their branded coin later this month. BitRail, LLC is a blockchain infrastructure that enables organizations to operate regulatory compliant cryptocurrencies for payment within their own platforms. The technology offers KYC and AML diligence, and high velocity transaction processing supported by money transfer licensing. BitRail provides companies and institutions an alternative choice to costly credit cards and other fee-heavy digital payment options. By powering uniquely branded economies, the platform also helps drive customer loyalty and makes regulated cryptocurrencies available for common transactions with impressive speed and ease-of-use. Founded by serial entrepreneurs Steve Urvan and Cameron Chell, and headquartered in Atlanta, BitRail was created through a partnership with ICOx Innovations (OTC: ICOX), a global platform for companies building corporate currencies. The BitRail platform aims to enable compliant cryptocurrencies for payments in accordance with state money transmitter laws and FinCEN. ICOx is positioned for the long term as an enterprise platform for building branded blockchain economies for established brands. ICOx Innovations Inc. provides a platform for the design and creation of branded blockchain economies that solve real-world problems with established organizations. ICOx Innovations provides operational insights intended to benefit and grow its customers’ businesses through the use of blockchain technology and branded corporate currencies. The ICOx Innovations platform is compliance-driven and combines rigorous strategic planning, capital structuring, technical integration and token economics model development, designed to allow its clients to create sustainable economies. The ICOx Innovations team co-founded KODAKOne, a blockchain-based image-rights management platform, and is the co-architect of KODAKCoin, the token that will reward and incentivize the KODAKOne platform users. Notably the Honorable Edmund C. Moy, 38th Director of the United States Mint (2006-2011) and the Honorable Alphonso Jackson, Former US Cabinet Secretary & Former Vice-Chair of JP Morgan Chase are members of the ICOx Board of Directors, For more information on ICOx Innovations, go to: www.icoxinnovations.com. Please visit www.icox.tv to sign up for the ICOX Video Newsletter. For additional investor info visit www.icoxinnovations.com or www.sedar.com and www.sec.gov searching symbol ICOX. LOS ANGELES, Jan. 09, 2019 (GLOBE NEWSWIRE) -- ICOx Innovations Inc, (TSXV and OTC: ICOX) (the "Company" or "ICOx Innovations”), which designs and creates blockchain economies for established companies to benefit and grow their businesses through blockchain technologies and branded cryptocurrencies, announced today that its client, the blockchain-based KODAKOne Image Rights Management Platform and the KODAKCoin cryptocurrency, has generated post-licensing cases valued at over $1M since the Post-Licensing Portal component of the KODAKOne Platform went live in private beta in October 2018. The KODAKOne PLP has already generated 1,667 new cases since its beta launch in October. Executives from ICOx Innovations, KODAK and KODAKOne’s creator RYDE Holding, Inc. are attending CES, where the intention to build the KODAKOne platform was first announced, to celebrate this milestone. Under the guidance of ICOx Innovations, the platform is positioned to be a leading service provider to the image industry with the goal to help agencies and photographers protect their work, increase image sales and ensure they are fairly compensated. The beta platform is currently operational and being used by agencies including Blaublut Edition and Food Centrale, as well as numerous photographers, with multiple international customers in the pipeline for the next phase of deployment. The KODAKOne PLP utilizes artificial intelligence powered web crawler and image-recognition technology to offer photographers and rights-holders dependable and trustworthy online image-usage tracking. This is coupled with a positive and user-friendly approach to help convert infringers into customers. The portal gives rights infringers a simple step-by-step process to make it easy to license image usages retroactively and avoid unnecessary legal disputes. As a business partner and equity stakeholder in the company, ICOx Innovations assists RYDE Holding with developing and integrating KODAKOne’s blockchain and cryptocurrency technologies, as well as strategy and corporate business development offerings related to KODAKCoin and the KODAKOne platform. RYDE Holding has a brand licensing agreement with the iconic imaging technology company to use the Kodak brand in connection with the KODAKOne platform and KODAKCoin. While the KODAKOne PLP protects image creators’ rights today, the distributed ledger technology that KODAKOne is developing will expand efforts to prevent infringement of many kinds of digital assets in the future. The blockchain registry will immutably store more relevant information associated with an image with a smart contract-based registration. Records on the blockchain are tamper-proof, providing undeniable claims to ownership. All intellectual property such as personality rights, property rights, licensing rights, and brands can be managed by the platform in the near future. Other blockchain projects will be able to join the KODAKOne platform to protect their assets in a similar way, while they are connected. With ongoing assistance from ICOx Innovations, the KODAKOne platform is planned to be launched and fully operational in 2019. ICOx Innovations is positioned for the long term as an enterprise platform for building blockchain economies for established brands. ICOx Innovations provides a platform for the design and creation of crypto economies that solve real-world problems with established organizations. ICOx Innovations provides operational insights intended to benefit and grow its customers’ businesses through the use of blockchain technology and cryptocurrencies. The ICOx Innovations platform is compliance-driven and combines rigorous strategic planning, capital structuring, technical integration and token economics model development, designed to allow its clients to create sustainable economies. The ICOx Innovations team co-founded KODAKOne, a blockchain-based image-rights management platform, and is the co-architect of KODAKCoin, the token that will reward and incentivize the KODAKOne platform users. Notably the Honorable Edmund C. Moy, 38th Director of the United States Mint (2006-2011) and the Honorable Alphonso Jackson, Former US Cabinet Secretary & Former Vice-Chair of JP Morgan Chase are members of the ICOx Board of Directors, For more information on ICOx Innovations, go to: www.icoxinnovations.com. RYDE Holding, Inc. (formerly WENN Digital, Inc.), a brand licensee of Eastman Kodak Company, is the creator and operator of the KODAKOne Platform and the KODAKCoin Tokens. RYDE and its advisors are an experienced development and operations team with expertise in proprietary blockchain development, big data, copyright law, AI-enabled image recognition and post-licensing monetization systems. For more information, go to kodakone.com. This news release contains “forward-looking statements.” Statements in this news release that are not purely historical are forward-looking statements and include any statements regarding beliefs, plans, expectations or intentions regarding the future. Such forward-looking statements include, among other things, the statements: that under the guidance of ICOx Innovations, the platform is positioned to be a leading service provider to the image industry with the goal to help agencies and photographers protect their work, increase image sales and ensure they are fairly compensated; that there are multiple international customers in the pipeline for the next phase of deployment; that the early successes will pave the way for the broader rollout of the full KODAKOne platform; that the Company hopes these accomplishments will serve as proof points for big brands curious about these technologies’ ability to improve their businesses and customers’ experiences; that this is just the beginning of the KODAKOne platform’s exciting future, which will be enriched by the incorporation of the blockchain; that the distributed ledger technology that KODAKOne is developing will expand efforts to prevent infringement of many kinds of digital assets in the future; that all intellectual property such as personality rights, property rights, licensing rights, and brands can be managed by the platform in the near future; that other blockchain projects will be able to join the KODAKOne platform to protect their assets in a similar way; and that the KODAKOne platform is planned to be launched and fully operational in 2019. The material assumptions supporting these forward-looking statements include, among others, that there will be no material variations in current regulatory environments in which the Company or its clients operate; the Company’s operating expenses, including general and administrative expenses, will be as expected; the Company will be able to obtain any necessary financing on acceptable terms; that the Company will be able to retain and recent the of skilled personnel necessary to complete its projects. Although management considers these assumptions to be reasonable based on information currently available to it, they may prove to be incorrect. These forward-looking statements are only predictions and involve known and unknown risks, uncertainties and other factors, including: the risk that the Company will be unable to efficiently manage the Company’s operations, including the project for KODAKOne; the risk that there may be negative changes in general economic and business conditions; the risk that the Company may have negative operating cash flow and not enough capital to complete its projects; the risk that the Company may not be able to obtain additional financing as necessary; the risk that there may be increases in capital and operating costs; the risk the cryptocurrency and other trading platforms are relatively new, largely unregulated and may not be accepted by the public as a payment platform; the risk that the platform of the Company’s clients may be subject to fraud and other failures; the risk that there may be technological changes and developments in the blockchain and cryptocurrencies that make the Company’s projects obsolete; risks relating to regulatory changes or actions which may impede the Company’s ability to complete its projects; the risk that other competitors may release platforms similar to those of the Company’s clients; and other general risks involved in the cryptocurrency industry. Any of these risks may cause the Company’s actual results, levels of activity, performance or achievements to be materially different from any future results, levels of activity, performance or achievements expressed or implied by these forward-looking statements. Further, although the Company has attempted to identify factors that could cause actual results, levels of activity, performance or achievements to differ materially from those described in forward-looking statements, there may be other factors that cause results, levels of activity, performance or achievements not to be as anticipated, estimated or intended. These forward-looking statements are made as of the date of this news release, and the Company assumes no obligation to update the forward-looking statements, or to update the reasons why actual results could differ from those projected in the forward-looking statements, except as required by applicable law, including the securities laws of the United States and Canada. Although the Company believes that any beliefs, plans, expectations and intentions contained in this news release are reasonable, there can be no assurance that any such beliefs, plans, expectations or intentions will prove to be accurate. Readers should consult all of the information set forth herein and should also refer to the risk factors disclosure outlined in the reports and other documents the Company files with the SEC, available at www.sec.gov, and on the SEDAR, available at www.sedar.com. Los Angeles, CA , May 10, 2018 (GLOBE NEWSWIRE) — ICOx Innovations Inc. ( “ICOx Innovations”) (OTCPK:ICOX), who is in the business of designing and creating crypto economies is pleased to announce that their client, WENN Digital has announced that their KODAKOne platform and the underlying KODAKCoin will officially commence the $1.00 round of its offering of the Simple Agreement for Future Token (SAFT) on May 21, 2018. KODAKOne is an image protection, monetization and distribution platform secured in the blockchain, which is expected to launch a beta program in 2018, will provide an image marketplace where users can buy, sell and trade photos based on licensing terms and conditions – serving as a one-stop shop for photographers’ management, protection and distribution needs. The platform will create an encrypted ledger of rights ownership for photographers to protect, manage and monetize their new and archived works – making it significantly cheaper and faster to register, move and sell their digital images. “ICOx Innovations brought Eastman Kodak and the WENN Digital team together to create the KODAKOne platform and co-architected the KODAKCoin. We are extremely excited to get this project to this stage. Bringing today’s technology to solve real problems with big brands and executing the process in the most efficient and regulatory compliant manner, we believe we are setting a path in developing what will be a healthy and vibrant crypto industry” said Bruce Elliott, President of ICOx Innovations. WENN Digital, in brand licensee partnership with Kodak, is the creator and operator of the KODAKOne Platform and the KODAKCoin tokens. WENN Digital and its advisors are an experienced development and operations team with expertise in proprietary blockchain development, big data, copyright law, AI-enabled image recognition and post-licensing monetization systems. More information about KODAKOne’s features and capabilities can be found at www.kodakone.com. Certain statements contained in this news release constitute forward-looking information. These statements relate to future events or the Company’s future performance. The use of any of the words “could”, “expect”, “believe”, “will”, “projected”, “estimated” and similar expressions and statements relating to matters that are not historical facts are intended to identify forward-looking information and are based on the Company’s current belief or assumptions as to the outcome and timing of such future events. Actual future results may differ materially. The Company’s Annual Information Form and other documents filed with securities regulatory authorities (accessible through the SEDAR and or EDGAR websites) describe the risks, material assumptions and other factors that could influence actual results and which are incorporated herein by reference. The Company disclaims any intention or obligation to publicly update or revise any forward-looking information, whether as a result of new information, future events or otherwise, except as may be expressly required by applicable securities laws. Los Angeles CA, February 22, 2018 — ICOx Innovations (the “Company”) is pleased to announce that Honorable Edmund C. Moy, the 38 th director of the United States Mint (2006- 2011), has joined its board of directors. ICOx Innovations designs and creates crypto- economies for established companies that can benefit and grow their business through the use of blockchain technology and cryptocurrencies. “We are thrilled to have Ed Moy on our board of directors. He brings a wealth of experience as a public servant, regulator, director and senior executive for both privately and publicly held companies.” said Bruce Elliott, President of ICOx Innovations. Los Angeles CA, February 15, 2018 — ICOx Innovations Inc. ( “ICOx Innovations”), a company that provides operational support for designers and builders of cryptoeconomies, who may then sell their tokens in compliance with applicable law in sales commonly referred to as Initial Coin Offerings (ICOs), is pleased to announce that its first blockchain client token, KODAKCoin will host and manage its community development and activities from the ICOxConnect.com community platform. KODAKCoin, a product of WENN Digital, was announced at the 2018 Consumer Electronic Show, ICOxConnect.com is the blockchain industry’s first compliance-driven tokenholder social and information platform for connecting tokenholders and participants to the executive management team of token issuing corporations. ICOxConnect.com is the first and, to date only community development platform that purposefully restricts its listings to ICOs that comply with applicable law. The ICOxConnect.com platform aims to provide a forum for the communities that support coins that are in compliance with applicable law. Utilizing blockchain technology, the KODAKOne platform is intended to create an encrypted, digital ledger of rights ownership for photographic archives as well as for photographers to register both new and archive work that they can then license within the platform. With KodakCoins, participating archives and photographers may take part in a new economy for photography, receive payment for licensing their work immediately upon sale, become eligible to receive certain economic benefits from the overall platform, and for both professional and amateur photographers, sell their work confidently on a secure blockchain platform. Los Angeles, CA, May 10, 2018 (GLOBE NEWSWIRE) -- WENN Digital, Inc., the developer of the KODAKOne Image Rights Management Platform (KODAKOne Platform), a blockchain-based image rights management and protection platform, announced that the full $1.00 round of its offering of Simple Agreements for Future Tokens (SAFTs) and the underlying KODAKCoin Token will officially commence on May 21, 2018. The offering will be facilitated through Cointopia (www.cointopia.com) and managed via Pickwick Capital Partners, LLC and Exemplar Capital, LLC, both FINRA-member firms and SEC-registered broker-dealers. KODAKOne Platform is an image protection, monetization and distribution platform secured in blockchain, which is expected to launch a beta program in late 2018, will provide an image marketplace where users can buy, sell and trade photos based on licensing terms and conditions – serving as a one-stop shop for photographers’ management, protection and distribution needs. The platform will create an encrypted ledger of rights ownership for photographers to protect, manage and monetize their new and archived works – making it significantly cheaper and faster to register, move and sell their digital images. More information about KODAKOne Platform’s features and capabilities can be found at www.kodakone.com. WENN Digital, a brand licensee of Eastman Kodak Company, is the creator and operator of the KODAKOne Platform and the KODAKCoin Tokens. WENN Digital and its advisors are an experienced development and operations team with expertise in proprietary blockchain development, big data, copyright law, AI-enabled image recognition and post-licensing monetization systems. Cointopia is an ICO management platform, founded by a seasoned team of successful technology and business veterans. The company is also backed by the biggest names in the technology industry, including Brock Pierce, Gil Penchina, Mark Pincus, Michael Arrington, Jeremy Gardner, Richard Titus, Michael Terpin, Sonny Singh, Mike Costache and Roger Lim. This release contains forward-looking statements, including statements relating to future events or to WENN Digital’s and KODAKOne Platform’s future performance, operations, financial results, business and products. The use of any of words “anticipate,” “may,” “believe,” “could,” “should,” “estimate,” “expect,” “intend,” “plan,” “predict,” “potential,” “forecasts,” “project,” and other similar expressions and statements relating to matters that are not historical facts are intended to identify forward-looking information. Forward-looking statements are made based upon WENN Digital’s current expectations and beliefs concerning future developments and their potential effects on WENN Digital, KODAKOne Platform and/or KODAKCoin Token. Such forward-looking statements are not guarantees of future performance or operations, and actual future results may differ materially. The offering memorandum for the SAFT/KODAKCoin Token offering describes the risks, material assumptions and other factors that could influence actual results and the development and performance of KODAKOne Platform. WENN Digital disclaims any intention or obligation to publicly update or revise any forward-looking information, whether as a result of new information, future events or otherwise, except as may be expressly required by applicable securities laws. Neither the SAFTs being offered nor the KODAKCoin Token issuable thereunder have been registered under the US Securities Act of 1933, as amended (the “Securities Act”), under the laws of any US states, or under the laws of any non-US jurisdictions. Accordingly, WENN Digital is offering the SAFTs and the underlying KODAKCoin Token only in exempt transactions to “accredited investors” (as defined in Rule 501(a) of Regulation D under the Securities Act) pursuant to Rule 506(c) of Regulation D under the Securities Act. Offers and sales of the SAFTs and KODAKCoin Token issuable thereunder outside the United States will also be made in accordance with the laws and regulations of the relevant jurisdictions. This release does not constitute an offer to sell, or a solicitation of an offer to buy, SAFTs or KODAKCoin Token issuable thereunder in any jurisdiction in which it is unlawful to make such an offer or solicitation and is for informational purposes only. Neither the SEC nor any other federal, state or foreign regulatory authority has approved an investment in SAFTs or KODAKCoin Token issuable thereunder. Following the offering, the SAFTs and any KODAKCoin Token issuable thereunder will be subject to significant restrictions on resale and transfer in addition to those traditionally associated with securities sold pursuant to Rule 506(c) under the Securities Act. Purchasing a SAFT and KODAKCoin Token involves a high degree of risk and potential purchasers should review in detail the “Risk Factors” and other information included in the offering memorandum before making an investment decision. The KODAK, KODAKOne and KODAKCoin trademarks, Kodak logo and trade dress are used by WENN Digital, Inc. under license from Eastman Kodak Company. 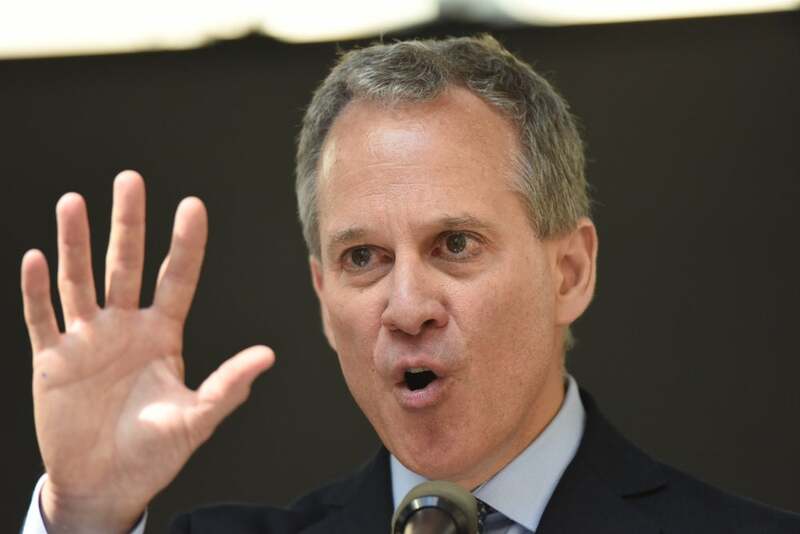 New York Attorney General Eric Schneiderman announces an inquiry into cryptocurrency exchanges.